Today, I’m bringing you an excerpt from our forthcoming book, The Colette Guide to Sewing Knits (available April 15). I can’t believe the release is only a week away! Today, we’re going to learn about one of the handiest trims out there, clear elastic. Elastics and knit fabrics go together like peanut butter and jelly. Because elastics are designed for stretch, they will have no problem moving with your garment. They can be put to all kinds of interesting uses, from stabilizing seams to creating shirring. Clear elastic has many uses, but can be a little tricky to handle. When using it at home, allow yourself some patience while you get the positioning correct. If you find the elastic is sticking to your presser foot, try using a special Teflon-coated foot. When clear elastic is installed in commercial manufacturing, it is done with a feeder foot, so the machine operator doesn’t have to worry about keeping the correct tension or the elastic slipping. 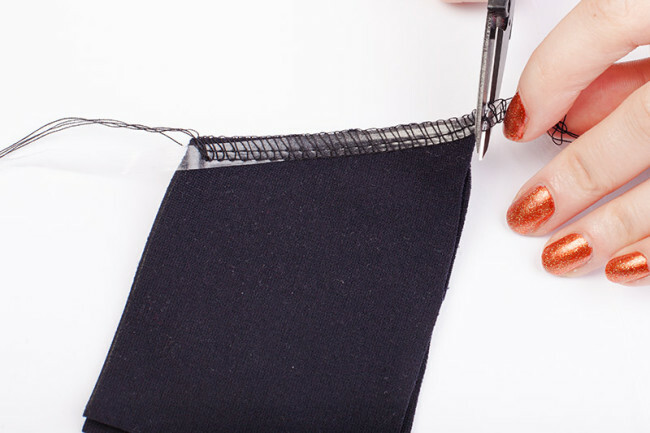 So if you become envious when you see that “perfect” elastic on a garment purchased from a large store, remember that it was installed without a hand touching it and a lot of help from special equipment. Clear elastic can be used to stabilize seams such as shoulders and necklines to prevent them from stretching out. I also put it in dresses that have waistlines that are tapered and will be stretched over shoulders and busts when put on. If you have a seam that will be stretched a lot and needs to maintain its shape, clear elastic will do the job. For this purpose, the elastic is installed in a 1:1 ratio with the fabric. When purchasing clear elastic you should always buy more than you need. If a seam needs to be torn out it’s better to start with a fresh piece. Clear elastic is neither knit or woven, so if you put a needle through it, it actually punctures the elastic. When sewing, leave excess on either end of the seam. Cutting the elastic the same length as the seam you are installing it to makes it very hard to handle at the beginning and end. If you’re installing clear elastic in a body seam it is not necessary to sew it in first and then sew the seam together. 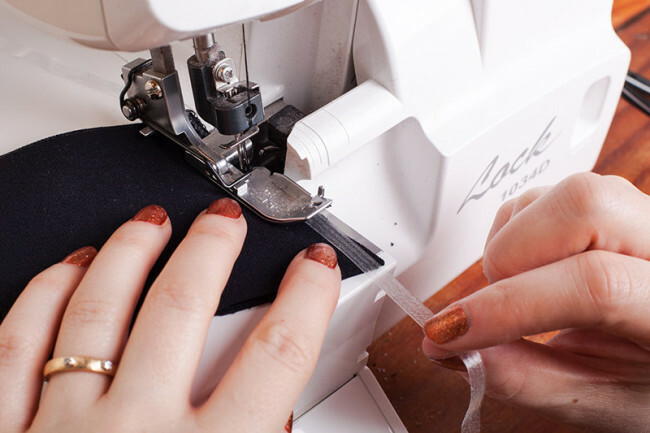 It is better to have less thread bulk and not stretch a seam by stitching on it more times than necessary. 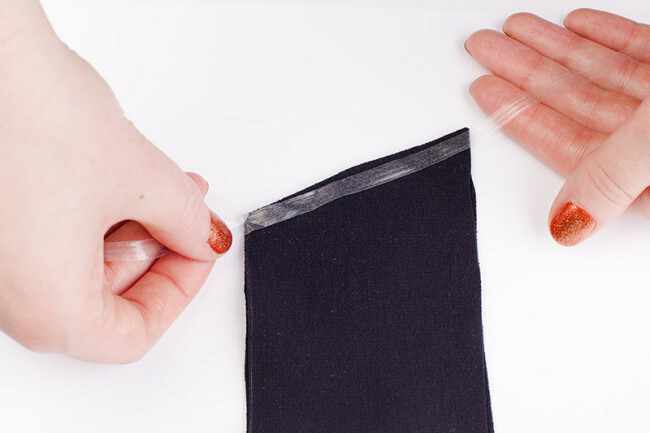 Arrange your sewing so that the clear elastic is either on the top of the fabric, or sandwiched between two layers. The important thing is to avoid contact between the elastic and the feed dogs. 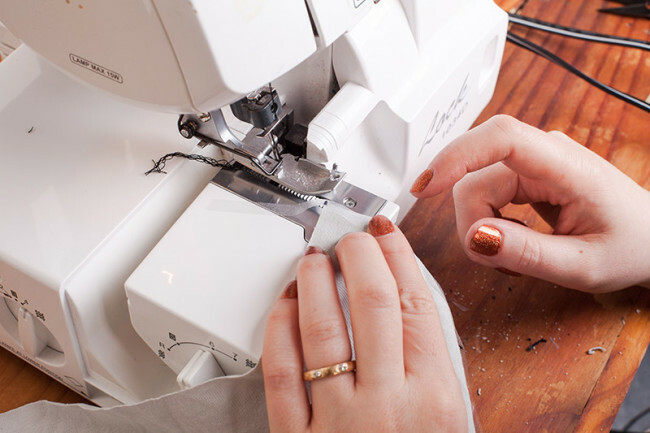 Sew your seam, stitching over the clear elastic to secure it in the seam allowance. Sew as if it is one with the fabric, without stretching. If you are sewing a seam that is not closed on the ends make sure to leave some excess elastic behind the presser foot beyond the beginning of your seam. Leave the excess at the end. Once you have sewn the seam and removed the piece, trim away excess elastic. Clear elastic can also be used to gather fabric in places where you want a bit of shirring, much like any other elastic. There are two methods you can use for this. If you are using clear elastic to gather as well stabilize, it is a good idea to gather first, and then stabilize. Use your sewing machine to create two rows of basting stitches. Pull the bobbin threads and adjust the fabric to create even gathers. After gathering, install the clear elastic along the seam when putting the garment together, following the instructions above. As always, if you sew a gathered seam to a non-gathered seam, make sure the non-gathered seam is against the feed dogs while sewing. 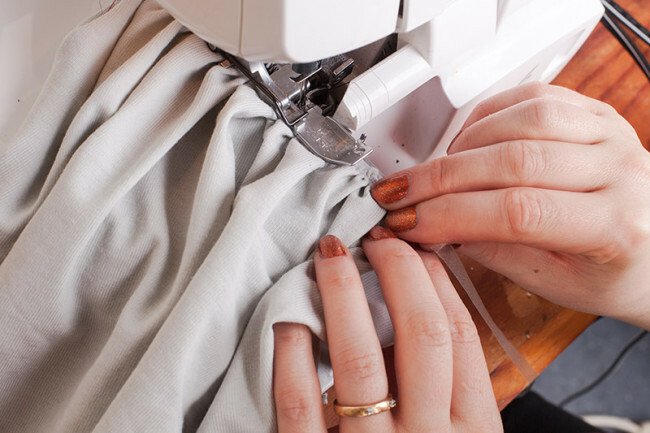 This is a great method for shirring and gathering perfectionists because you can see your distribution of gathers before committing to the seam. After you sew the seam with the clear elastic, remove your basting stitches, as they may pop when stretched. 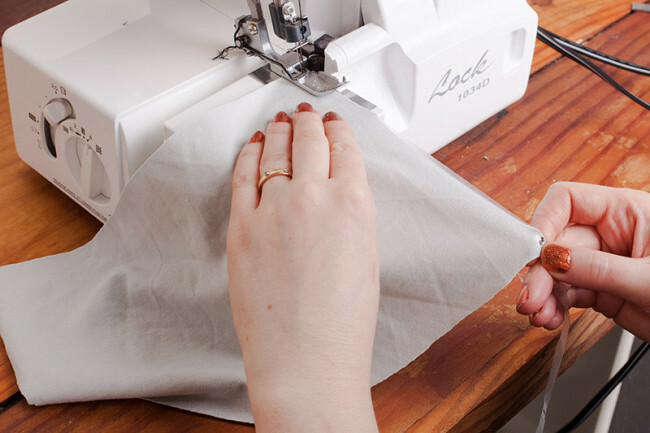 This method allows you to stretch as you sew (the elastic, not the fabric!). Mark the final length on the elastic with a marker. Leave a few inches of excess at the beginning and end of the elastic; this will provide you with something to hold on to as you are sewing. 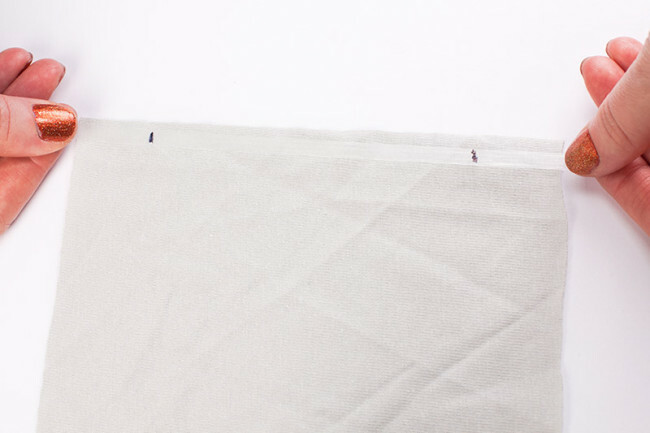 Align the first marked point with the edge of the fabric, or the place you would like the gathers to begin. Begin sewing a few stitches to secure. Stretch the elastic as you sew, so that the second marked point aligns with the other edge of fabric, or the place you would like the gathers to end. For a proportionate distribution of gathers, do not let the tension on the elastic waver as you sew. If done correctly, the gathers will be even and your seam will be stabilized as well. Have you ever worked with clear elastic before? Have you used it for stabilizing, gathering, or both? Brilliant! I’ve been psyching myself up to wing my way through gathering like this later on tonight – and now you’ve done all the brain work for me! Thank you!! Great tutorial, thanks! I use clear elastic on shoulder seams of knit tops or dresses, and at waistlines of dreses when the waist is fitted with a full skirt. Dying for the book and the new knit patterns – you are such a tease! 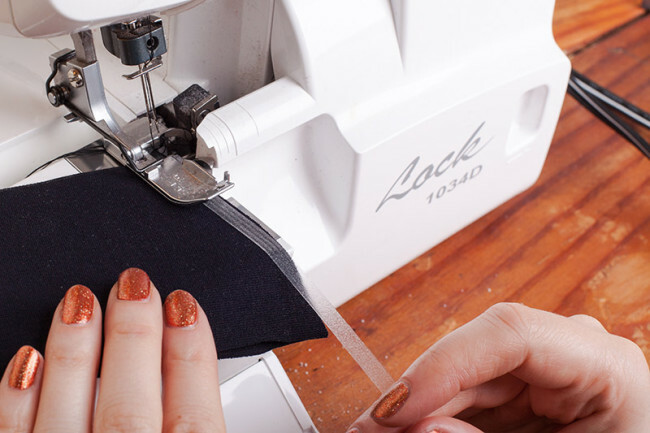 Is it worth buying an elastic foot for your serger? I was considering it since I sew so many knits, but I just looked it up and the foot is around $40. I don’t have one, but maybe someone else can chime in with their experience. Hi Miriam! If you sew a lot of elastic I would vote yes, if the foot works with your budget. The time savings on sewing with it is great. Also, it feeds the elastic into yours seam wonderfully. I would suggest going with one for 1/4″ clear elastic. That way if you are sewing with a 3/8″ seam allowance your elastic is tucked away neatly into the seam every time. If you have a sewing machine shop nearby, go in and ask for a test drive with the foot, and see how you like it. I’ve torn out way more clear elastic than I would like to admit over the years. Also see if the foot works with other elastics, like braided or woven. You may get more use out of it! Thats so funny, I was about to comment on the great pumpkin sparkle nail polish too! me, three on the manicure! The polish is an OPI color from a few years ago called Take The Stage. It has a light gold glitter top coat. The look works great with any polish that has a little sparkle. Glad you like, it is my fall favorite! Also, as a general note, I have been following your blog for some time now (about 3 years) and its totally awesome to see how you continue to grow your knowledge and share articulate tutorials. A sign of true mastery! Thank you. I like to give the clear elastic a couple stretches before I sew it in. The first stretch of it, I find, it will not snap back to quite the original size. So stretch and look silly for a minute then measure and sew with it. I had tried a shirt that had elastic at each side for gathers and oh how I wish I had seen this tutorial. Thank you for posting such great information…I will be waiting happily in line to buy the book and have Mother’s Day in mind for great gift ideas! Do you have any tips on how to keep the elastic away from the skin? I tend to get hives when the clear elastic comes in contact with me, so I have avoided using it. Or, alternatively, is there another method for getting a similar result? Thanks, and looking forward to the book! You can always sandwich it between two layers. So if you were sewing it in a waistline for example, you would sew it so that it’s between the bodice and the skirt. Thank you! I have wondered about the best way to do this. Can’t wait for the book! I have tried to use clear elastic before but never quite knew what I was doing. I cannot wait to get this book! I’ve not used clear elastic tape, and I may be more intimidated now! But, I will try it sometime. I have used knitted fabric scraps for the same purpose in shoulder seams in a knit garment. I buy it, try it every time I see a new way to make it work and it never works for me. Not with my sewing machine anyway. I’ve tried the last method with my sewing machine and just had the elastic tear. I’ll have to play around with it using your tutorials. Hi Nancy! Maybe try switching your needles on the machine? Once that stuff gets a tear in it, it can be deadly to the piece of elastic. I’ve used the clear elastic as a stabilizer and not on its own as elastic. It does need to be prestretched, it will tear if overstitched, and it’s failed me (though I caught the skirt before it hit the floor!) as I don’t think it holds much weight. But in short bursts, it’s a midweight seam support. Interesting in knit hems. I never stretch before sewing it. In manufacturing it is not pre-stretched either. It just comes right off the spool. I need to add clear elastic to a dress waistline that has been bugging me for ages. Thanks! clear elastic needs a low iron heat. ask me how i know (on second thought, please don’t). What a lovely, well thought out tutorial! This sort of elastic is very economical and can do lots of things and look good from the outside of a garment. I see it lots in RTW knitwear. I’ve used clear elastic a number of times in my sewing over the past few years but no longer do. I find it quite uncomfortable :( I usually stabilize my shoulders, hems and other areas that aren’t meant to stretch (curved or straight) with an iron on knit bias stay tape (similar to Vilene Bias Tape), then serge the seam catching the stay tape. It’s very soft and nice against the skin if it ever touches. If it’s an elastic waist or shirring effect I expect to stretch I will use a soft, knit elastic that in a size the corks for the pattern I’m working with. I LOVE Vilene bias tape like it’s my first-born. It means I can do all the stabilising on the ironing board, straight after cutting, so there’s no chance of things stretching out of shape. It’s also useful for sewing wovens, especially where something is cut on the diagonal (eg slash pockets) or big neckline openings. Is there much difference between Vilene bias tape and the stay tape you use? As much as I love Vilene it is hard to source here. I use Pellon Easy Knit Tape. It’s adhesive on one side. It’s marketed to quilters for their quilty needs (I’m not a serious quilter, so I can’t easily explain the various quilting uses it may have and what not.) But it’s also for stabilizing curved and straight edges. It’s about two times wider then I ever need so I cut it down the middle as I use it. It doesn’t have the chain stitch down the middle like Vilene’s does. I’ve made my own version of Vilene Bias Tape, cutting bias strips from lightweight knit interfacing then making a stitch down the center. It works, but it’s sooo tedious to do. Excited to see more knit sewing talk on here! Thanks for the sneak peek, I’ll have to put that book on my wish list. And that nail polish is fantastic! (I always notice the important things haha). Is the book/pattern bundle you are selling for an ebook and printable patterns? Or is it an actual book and paper patterns? The pre-order bundle is for printed versions only. The digital versions will be available on the 15th. Sorry it took me a while to find this comment! 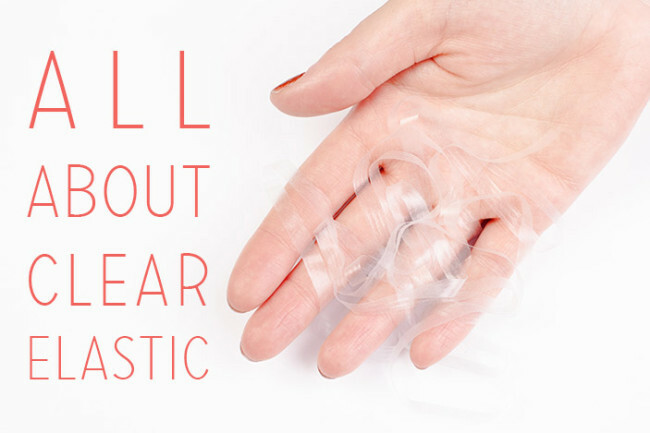 Have you tried a regular elastic instead of clear, perhaps? You can use it (make sure it is elastic that is designed to be sewn through), but it may add more bulk. I’ve found that strips of self-fabric can also work well, depending on the fabric. Try a test seam and really pull and stretch it to test it out. 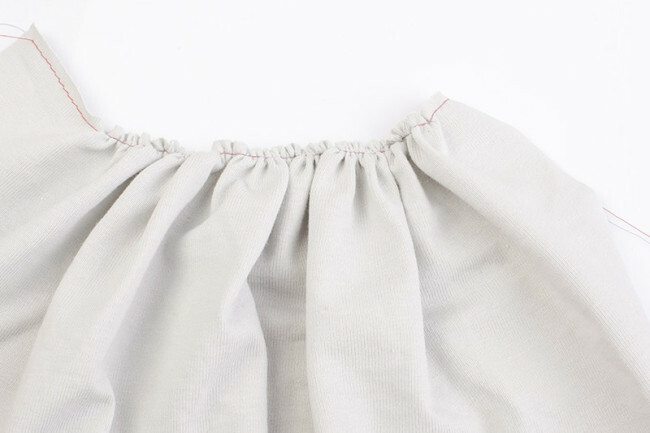 Quick question: the elastic in Method #1 is NOT stretched as it is sewn on top of the gathered skirt to bodice seam, correct? Many thanks! I love the stretch as you sew technique! I finished not one, not two, but THREE Moneta’s this weekend, and gathering using the clear elastic is just a breeze. I found it helpful to mark the elastic in 8 sections and to make corresponding marks on the bodice because I was making the 3x and it was easier to manage smaller lengths of fabric. I have used clear elastic a lot as many of my knit designs have gathers or ruching and I use the elastic to stablize those gathers when sewing a seam. Otherwise, I find they stretch out when I’m trying to serge. One of my issues is that the underside of the serged stitch always comes out loopy and not right when sewing over the elastic. It’s frustrating, and it can cause the seam to not stay tight. I usually sew over again which helps secure but doesn’t look as clean.